Logitank manufactures a complete range of containerised and self bunded tanks for storing a range of fluids including fuels and lubricants. Logitank manufactures above ground tanks for stand alone use or large projects such as bulk fuel or lubricant storage facilities. Logitank products are designed and manufactured to withstand harsh operating environments with quality control measures in place to ensure product quality. Logitank can customise tanks to suit a range of fluids such as aviation fuels or liquid chemicals. Tanks can also be manufactured to suit individual business applications. 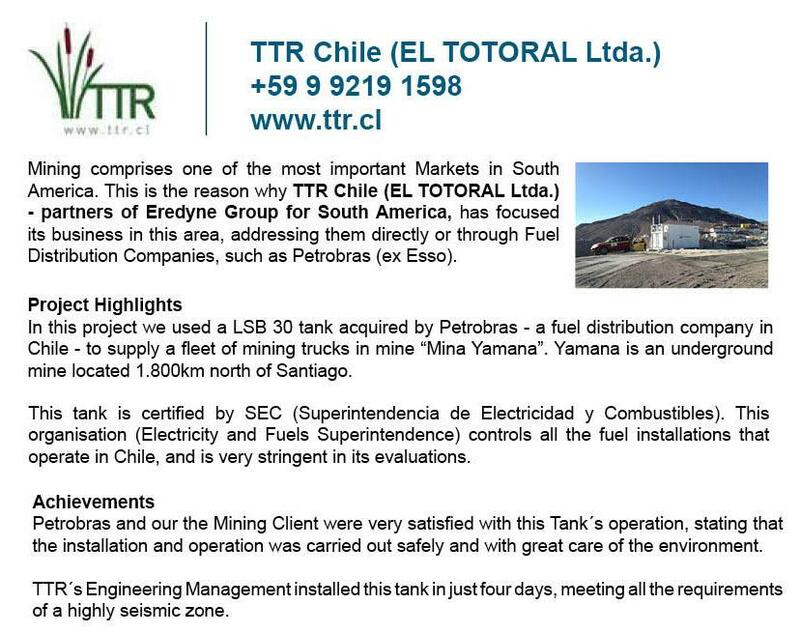 Logitank tanks installed at Pascua Lama, a mine belonging to Barrick, by our partner in Chile, TTR. This mine is located at 4,500 meters above sea level and has weather conditions with temperatures ranging from 35°C to -20°C. The customer commented "we find it very operative and this installation represents a technological innovation in this area" . Logtiank/TTR worked together to make this project a success and have won other jobs with the client due to the success of this project. A special recognition to our TTR technical staff that was at the site throughout the project and handover. 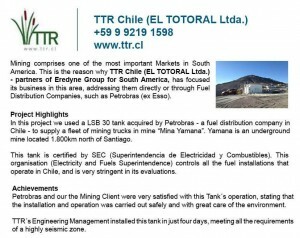 TTR partner for South America achieved great goals in Chile mining project. 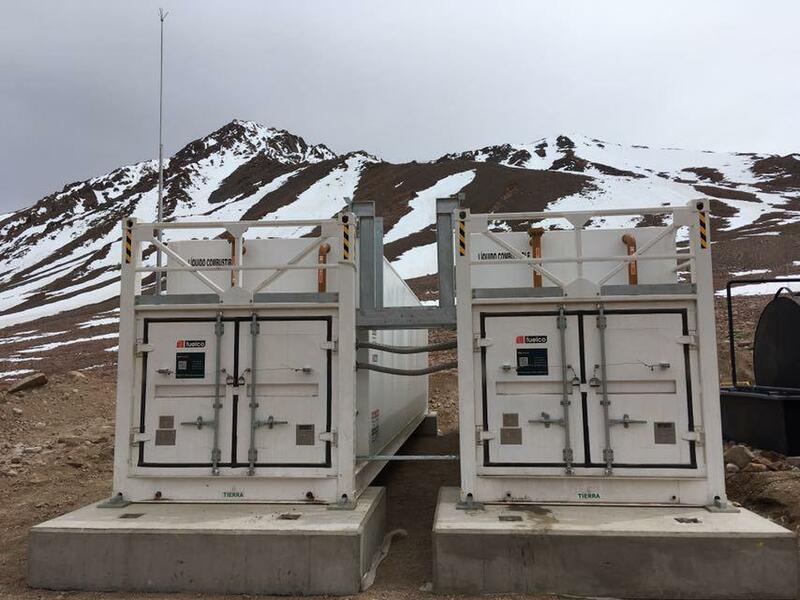 TTR's Engineering had the tank installed and operating in just four days, meeting all the safety requirements and regulations of a highly seismic zone. Well done team, another feather in our cap! Through our authorised distributors we have an international footprint across multiple continents. Regardless of locality we have the ability to service your petrochemical storage needs. Totoral Representaciones Ltda. (TTR Ltda.) Is the company that exclusively represents in Chile the products manufactured by Logitank in Australia. Petrotec Services is a construction an contracting company operating in the petroleum industry, specialising in hazardous substance with solutions and services across New Zealand. Fuelco supplies, installs and commissions containerised, self-bunded, environmentally friendly fuel storage tank solutions and services. Delivered across global infrastructure; our quality products are designed, built, and manufactured by in-house expertise before being transported internationally for use in bulk refuelling solutions. Click to see Why Logitank?